We’d love your help. 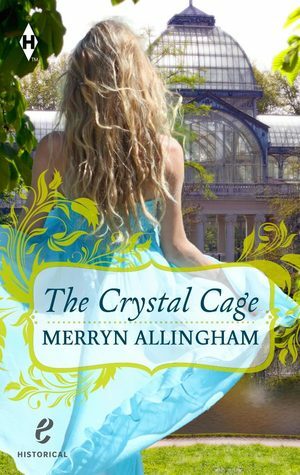 Let us know what’s wrong with this preview of The Crystal Cage by Merryn Allingham. Appearances don't always reveal the truth. Grace Latimer knows this better than most. Illusions of commitment and comfort have her trapped—until bohemian adventurer Nick Heysham charms his way into her world. Commissioned to recover a Great Exhibition architect's missing designs, he persuades her to assist in his research. The mystery of the Crystal Captivated…or captured? Appearances don't always reveal the truth. Grace Latimer knows this better than most. Illusions of commitment and comfort have her trapped—until bohemian adventurer Nick Heysham charms his way into her world. Commissioned to recover a Great Exhibition architect's missing designs, he persuades her to assist in his research. The mystery of the Crystal Palace seduces Grace, and once she discovers clues about a forbidden Victorian love affair, she's lured into the deep secrets of the past…secrets that resemble her own. To ask other readers questions about The Crystal Cage, please sign up. This is a book that came up on an Instafreebie deal, set in the present day and 1851, the story follows the quest to track down missing designs from an architect who worked at the Great Exhibition in London in the process, unlocking secrets and a love affair shattered. I loved the Historical element of the story set in 1851, however I didn’t enjoy reading the present day perspective as much. Grace the main character I found to be quite unenjoyable at times since she preferred to date other guys rather than see her estranged sister. Overall, I was left feeling disappointed. Allingham runs two parallel love stories with the past reaching an arm to the present. Two women hundreds of years apart with eerily comparable stories given their individual eras. The Great Exhibition is presented in extreme detail along with Victorian England en toto. Very well researched, allowing the reader to become part of the setting as well as narrative. The details paid to Grace and her quest once again appreciated, adding plausibility to the character and her sleuth skills. Allingham inc Allingham runs two parallel love stories with the past reaching an arm to the present. Two women hundreds of years apart with eerily comparable stories given their individual eras. Allingham incorporates not only a historical romance but elements of mystery and subdued suspense, giving the narrative a layer of dimension. Great ending, powerful sans a saccharin overdose most would expect. Abrupt but fitting. I had difficulty latching on to Grace. She wasn’t independent and strong enough for my liking, she kept falling into the same pattern which I found irritating. She managed to redeem herself towards the latter portion of the plot. I still found her frustrating, wishing she would have gathered her strength earlier and forged a path of her own, not relying on dead end relationships with similar pathetic type men. Rant over….. I absolutely loved this book! I love historical romances in which either the characters time travel, or the book time travels. The Crystal Cage juxtaposes between modern and the Victorian Era. The author does this very well, leaving me grappling to go forth between the times to discover the mysteries presented. As historical fiction is my favorite genre, I also enjoyed the historical details that she weaved throughout the story in the past and how much research she put into mid-1800s Victorian L I absolutely loved this book! I love historical romances in which either the characters time travel, or the book time travels. The Crystal Cage juxtaposes between modern and the Victorian Era. The author does this very well, leaving me grappling to go forth between the times to discover the mysteries presented. As historical fiction is my favorite genre, I also enjoyed the historical details that she weaved throughout the story in the past and how much research she put into mid-1800s Victorian London, during the time of The Great Exhibition, which is sometimes referred to as The Crystal Palace Exhibition (hence the book title, I think). This was totally enthralling for me, as I have a real obsession with anything World's Fair circa 19th or early 20th century! The Great Exhibition was an international exhibition that was held inside a great pavilion in London in 1851. It was first in a series of World's Fairs, organized in part by Prince Albert, the husband of Queen Victoria, monarch of England at the time. Grace, the women serving as sleuth in the modern day, taking on the mystery of a past 150 years before her, is a well-developed character. I admire her talent and motivation and feel connected to her due to her relationship issues with Nick, and even within herself. She's had to put up a wall around herself, and I relished in watching her unfurl out of her shell. After Nick asks her to help him work through the mystery of some missing historical pieces, she is intrigued by Lucas Royde, an architect of the past who designed the Pavilion at the Exhibition, and Alessia, of whom he has a relationship. Grace, who begins to unravel Royde's ghosts of the past, sees situations mirroring her own relationship. The pages of this book turned quickly as I watched visually in my head the intertwining and unfolding of these two relationships. As a female reader who likes reading novels that show women of the past overcoming circumstances, and even modern day women who do, I enjoyed how the author dealt with the elements of these couples and presented to us that though sometimes times change, they also DON'T change when it comes to love and gender roles in romance and work. Fears are still real, no matter what the century and the past can't seal the future. Which is where the cage part of the title comes into the mix! I believe the book was elegantly written, flowed nicely between the time periods and within the time periods, had excellent character development, and kept me intrigued and interested. I don't read much romance overall, but this one with its blend of history and mystery, really had me captivated for a few day's time. "The Crystal Cage" is a historical fiction with a heavy mystery element to it. The story takes place both in the present and also during the Great Exhibition during the mid to late 1800s. In this book, Grace is a researcher who is called upon by Nick, a modern day adventurer, to help him solve a mystery about what may have happened to some famous (and missing) architectural designs. At first, Grace is not sure that she really wants to help but she goes along with it anyway and ends up discoverin "The Crystal Cage" is a historical fiction with a heavy mystery element to it. The story takes place both in the present and also during the Great Exhibition during the mid to late 1800s. In this book, Grace is a researcher who is called upon by Nick, a modern day adventurer, to help him solve a mystery about what may have happened to some famous (and missing) architectural designs. At first, Grace is not sure that she really wants to help but she goes along with it anyway and ends up discovering some very important things about herself. It took me a little while to get into this book. At first, I wasn't really sure where story was going and Grace seemed to be sort of a hard character to get to know. In a lot of ways, she's very standoffish and we see that with the beginning of her relationship with Nick. Once the story really starts to get going we begin to see a different side of Grace which really helped endear her to me. I just takes a little while to get there so hang on! I will admit that The Crystal Cage took a bit to garner my full attention, but once it did I was hooked. The build up of the story and the development of the characters, at first, seemed to move a little slow for me. However, about a quarter of the way through, it really started to take off. I'm a huge sucker for historical romance. I love that this book took place in both the past, during the Great Exhibition, and the present. Both time periods mirror each other beautifully. Grace and Nick, the I will admit that The Crystal Cage took a bit to garner my full attention, but once it did I was hooked. The build up of the story and the development of the characters, at first, seemed to move a little slow for me. However, about a quarter of the way through, it really started to take off. I'm a huge sucker for historical romance. I love that this book took place in both the past, during the Great Exhibition, and the present. Both time periods mirror each other beautifully. Grace and Nick, the modern-day couple, have a fiery relationship that is marred with complications. They are thrown together to try to solve a mystery of epic portions. Their research brings them into the path of Alessia and Royde, a couple whose story unfolds beneath their gaze. Merryn Allingham has written a book that will not only appeal to the romance lovers, but to the mystery lovers as well. This is a well-told story that will leave you wanting more long after you read the last page. This is Allingham's first novel and it does not disappoint! The Crystal Cage explores the lives of two women who face the same dilemmas, even though they live 150 years apart: Grace in today's society, and Alessia in Victorian times. How Grace and Alessia cope with these issues and the eventual conclusion is told in a tale which is poignant but without sentimentality, and an intriguing and skilfully drawn plot. The result? A most engrossing book. Liked the historical story about the Great Exhibition. The love story that from that era is well written. But the present day characters somehow didn't gel for me, and I was disappointed. But Merryn's new book Daisy's War is a winner! Loved the mix of eras and historical facts, kept me wanting to turn pages. Well done. Charming. Probably more a 3.5, but feeling generous! It was an enjoyable read, I don't usually choose historical romance, but liked the mix of story lines. I did wonder if the author was hinting at something not then developed in the modern story line with the changes in Nick, something more sinister, but if there is ever a sequel maybe that would come out. I was born into an army family and spent my childhood moving around the UK and abroad. Unsurprisingly it gave me itchy feet and in my twenties I escaped an unloved secretarial career to work as cabin crew and see the world. I still love to travel and visit new places, especially those with an interesting history, but the arrival of marriage, children and cats meant a more settled life in the south I was born into an army family and spent my childhood moving around the UK and abroad. Unsurprisingly it gave me itchy feet and in my twenties I escaped an unloved secretarial career to work as cabin crew and see the world. I still love to travel and visit new places, especially those with an interesting history, but the arrival of marriage, children and cats meant a more settled life in the south of England, where I've lived ever since. It also gave me the opportunity to go back to 'school' and eventually teach at university. I've written seven historical novels, all mysteries with a helping of suspense and a dash of romance - sometimes set in exotic locations and often against a background of stirring world events. My latest novel, A Tale of Two Sisters, is set in Constantinople at the turn of the 20th century when rebellion within the Ottoman Empire is growing ever louder. Against this background the novel traces the fate of two sisters, Alice and Lydia Verinder, and explores themes of family, love and loss.